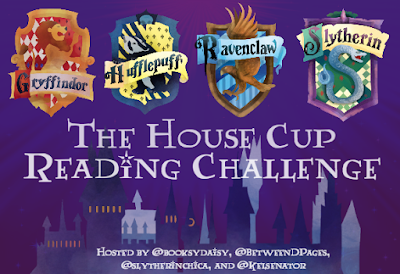 The House Cup Reading Challenge is a reading challenge hosted by Lauren of Live Love Read Ya, Alex of Book Daisy Reviews, Kelsey of Kelsey’s Cluttered Bookshelf, and Erica of Escape Under the Cover and it will take place between Sunday 15th October to Sunday 12th November. "During this challenge, you will progress from a first-year to seventh-year Hogwarts student by completing seven books on your TBR list. In addition to the main challenge, you will have opportunities to earn even more points by participating in the themed bonus challenges and tweeting with the challenge hashtag on Twitter. First, you’ll need to choose your Hogwarts house. During the challenge, you’ll not only be earning points for yourself but for your Hogwarts house as well. At the end of the challenge, each reader should report their points to their house’s Head Girl. " Name: Tânia. If my name doesn't sound Anglo-American, it's because it isn't. I'm from Portugal, a small country in Europe that most people think to be part of Spain. Anyway, I can't believe I finally received my Hogwarts letter. Hogwarts House: After a children's counting rhyme, it seems I'm a Gryffindor for the time being. It may change when another Sorting Hat quiz is created. Wand Type: Acacia wood with a Dragon heartstring core 12 ¾" and Brittle flexibility. Pet: Cat 🐱 Can I bring my five cats with me? I promise they will behave... well, the oldest ones will definitely behave, but I'm not so sure about the two younglings. Favorite Subject: How can I choose a favourite subject? Maybe the eeny, meeny, miny, moe should have sorted me into Ravenclaw... Okay, Defence Against the Dark Arts? But I also really like Care of Magical Creatures! Potions and Herbology also seem very interesting - to learn how to make the polyjouice potion or the uses of mandrake. Favorite Professor: Hagrid & Remus Lupin. By now you must have figured out my favourite book in the series is Harry Potter and the Prisoner of Azkaban. "To kick off the challenge, we’ll be hosting a Twitter chat starting at 8:00 p.m. EST to give everybody a chance to introduce themselves, talk about the competition, and answer some Harry Potter trivia questions. Be sure to follow along with the #housecupreadingchallenge hashtag. At the end of the challenge, we’ll also be hosting a watch-along of one of the Harry Potter movies (to be decided via Twitter poll). We’ll have more details about this as we get closer to the end of the challenge." Good luck! I hadn't made a proper TBR list yet either. Flying by the seat of my pants I think. Thank you. I'm not really good at creating long TBR lists. I only know which book I'm going to read when I finish my current reading because I've to send the review to the publisher.